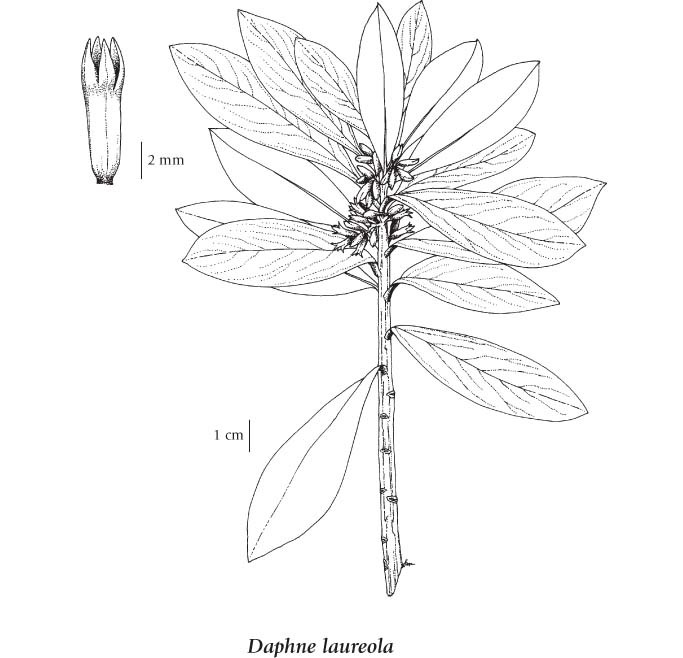 Spurge-laurel (Daphne laureola) is an invasive and noxious weed in BC. It is an introduced shrub that is found in Europe, southwestern Asia, north Africa and the Mediterranean region in oak and conifer woods ( Nevling and Barringer 2018). It has escaped from gardens in the Pacific Northwest and is now found throughout the southwest corner of the province. It easily spreads in gardens and in regional forests. The bark, sap and berries are toxic to humans: the sap is very irritating to the skin. This species is listed by the Canadian Poisonous Plants Information System, WorkSafe BC Toxic Plant Warning and the Invasive Plant Council of BC. The BC Ministry of Forests, Lands and Natural Resource Operations lists this species as a reportable weed in BC via their Report a Weed program. Evergreen shrub, bushy, 0.5-1.8 m tall. Alternate, oval to oblanceolate, tapering towards the base, dark green, somewhat glossy, 4-13 cm long. 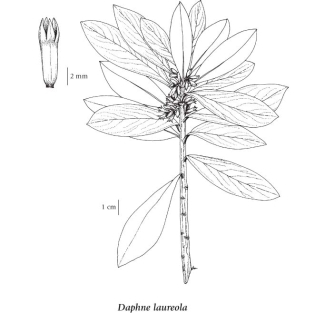 Inflorescence of axillary, nearly unstalked clusters; corollas lacking; calyces pale green, with 4 cylindrical, spreading lobes. Drupes, egg-shaped, black, 8-11 mm long. Mesic forests and waste areas in the lowland zone; infrequent on S Vancouver Island, the Gulf Islands and adjacent mainland; introduced from Eurasia.